The hot new trend for NFL teams looking to establish and sustain success is to construct a deep roster around a young quarterback on a cost-controlled contract. The Eagles won last year’s Super Bowl doing this. The Rams, Bears, Chiefs, Buccaneers, and Titans are using the same blueprint this season. And the Browns, Jets, and Bills (to varying degrees) are set up to shop for plenty of complementary pieces next year. Then there are the Cowboys, who have made a habit of paying top-market money to veteran players (which is good!) only to repeatedly restructure many of those deals, thus tying their hands right when quarterback Dak Prescott’s rookie contract should have left them with oodles of cap resources. The Cowboys will devote just $1.8 million in cap assets toward quarterbacks this season, roughly 10 percent of the league average of $18.3 million. Prescott, as a fourth-round pick, is slated to earn $630,000 this year, with one year remaining on his rookie deal. And yet his top two receivers are Allen Hurns and rookie Michael Gallup. It’s fairly safe to say the Cowboys’ wideouts are the league’s worst position group, and the problem lies in the way Jones has kept kicking the can down the road. As Barnwell notes, the Cowboys have been weighed down by $54 million in what’s known as dead money in 2017 and 2018. The Bills, Browns, and 49ers have doled out more, but they’ve all also changed regimes as part of massive rebuilding efforts in that time. The league median, meanwhile, is just $23 million. Dead money is a colloquial term the NFL uses to account for cash already paid to a player who’s no longer with a team. Say a player signs a three-year, $20 million deal that includes a $9 million signing bonus (which must be guaranteed). That $9 million will get paid up front, or at least in installments during the first year, depending on the team. But for cap purposes, the team accounts for that $9 million by spreading it across the three-year life of the contract, or $3 million per season. If that player were to get cut after Year 1 (assuming he had no other guarantees beyond that point), the $6 million that must be accounted for in Years 2 and 3 accelerates onto the team’s cap for Year 2. Which would leave that team with $6 million in dead money in Year 2. This brings us to restructures, which allow teams to carve out additional cap space in a current year by converting a portion of a player’s base salary into a signing bonus. This is typically good for the player, since he’s getting his money right away. But for the team, it’s a way of borrowing that space against the future, since the accounting for the signing bonus conversion gets spread across the life of the contract. Most teams avoid massive restructures like this because of the risk it places on teams if a given player were to get hurt or decline in skill. The Cowboys have not been most teams. Per Barnwell, the Cowboys restructured quarterback Tony Romo’s first big contract (signed in 2007) three times, which shoved more than $20 million in cap charges down the road. Romo then signed an extension in 2013 that was restructured twice and converted $28.5 million from base salaries to signing bonuses. At the time he signed the extension, Romo would have accounted for $5 million in dead money by being cut in 2017. Instead, that figure had ballooned all the way to $19.6 million. The Cowboys used a post-June 1 designation on that figure (another accounting trick), which allowed them to count $10.7 against last year’s cap and the remaining $8.9 million this year. That’s right: Romo hasn’t played since 2016—a year when he only was on the field for seven snaps—yet he still eats up nearly $9 million of the Cowboys’ 2018 cap. He’s not the only one. Barnwell goes on to break down all the other restructures the Cowboys have done, and there are many. It’s not uncommon for teams to redraw the occasional veteran contract with either a modest restructure or a heavily incentivized revision, such as the two the Patriots did in recent years for tight end Rob Gronkowski. The Cowboys stand to have anywhere from $60 million to $80 million in cap space next year, but they’ll also have some big choices to make, including whether to sign defensive end DeMarcus Lawrence to a costly extension. They can extend Ezekiel Elliott as early as next offseason. And they’ll have to decide whether to re-up with Prescott. Barring a complete belly-flop this season, they’ll likely have to do it—and it won’t be cheap. Two years ago, the Cowboys went 13-3 and had three remaining years on Prescott’s low-cost rookie deal. Now that window is closing. If Jerry Jones were smart, he’d start looking for a new GM. 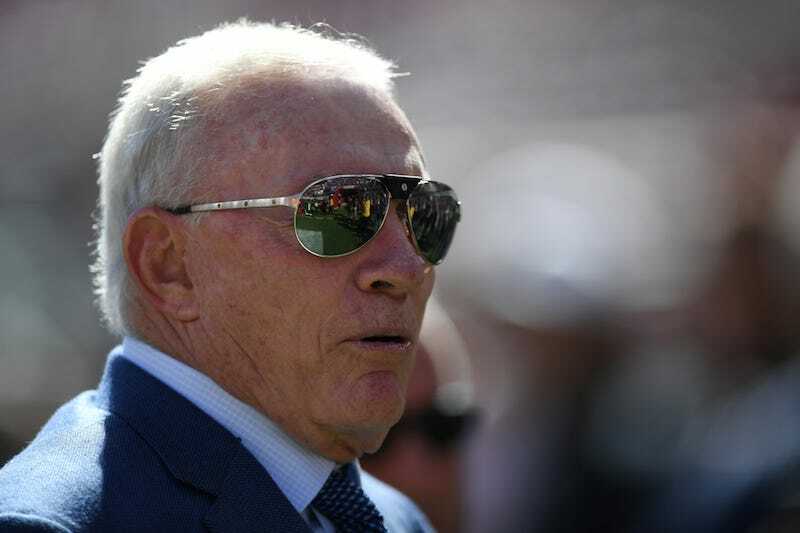 Jerry Jones Thinks You&apos;re Stupid Enough To Believe An 18-Game Season Would Be "Better For Players"